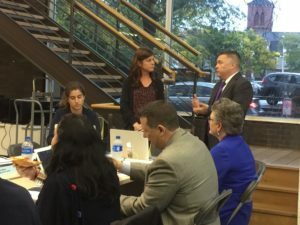 Artists are asked to volunteer their time and crafts more than most, so I am grateful to the artists in the Cambridge community who have once again volunteered their time to serve on the Mayor’s Arts Task Force. I’d like to start by thanking Mayor McGovern, who put this task force together to respond to issues of funding, lack of affordable studio and live/work space, and creative placemaking, particularly in our Cultural District. This work began before my time on the Council, when then Mayor Simmons put in a policy order to ask the City to come up with a comprehensive plan for the arts. She often says that “if you don’t know where you’re going, any train will get you there”, so I am looking forward to getting on this train with our arts community to find solutions to these pressing issues. This work is near and dear to my heart, as someone whose previous life was a clothing designer, I am an accidental politician with a creative soul. And I know this issue is deeply personal to all of our artists as well, because so many of them have faced the loss of affordable studio and creative space, barriers to permitting and licensing, lack of funding, and left out of the creative placemaking process. I was struck at last night’s meeting by how many of our artists connected the arts with their families, talking about the prominent role that arts played in their childhoods, or how they engage their own children in the arts today. 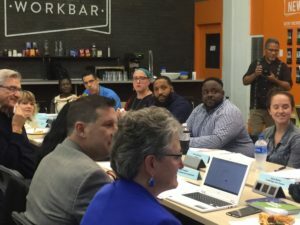 To me it’s so indicative about how the arts is something that connects us all together as a community, which is why I was so grateful to be able to sit around a table with all of the important stakeholders and serve as a connector for our arts community, City leaders, and those who can provide more resources. Last night’s meeting served not only as an introduction for all of our members, but also as an orientation to State and local perspectives. We were joined by Greg Laikos, the State Communications Director of the Massachusetts Cultural Council, who gave us an overview of best practices such as New Bedford’s use of the hotel/motel tax to fund their arts programs, and Lowell’s Cultural Organization of Lowell (COOL), which provides a one stop resource shop for all local artists. Greg also spoke to the task force about the various grant and funding programs MCC provides to cultural councils and individual artists – the organization gives out about $5 million to help individual artists and partner institutions, $3.5 million in funding to local cultural councils, and has its own program dedicated to Creative Youth Development, an after school program that engages teenagers in the arts to teach them both art and workforce skills. The Executive Director of our arts Council, Jason Weeks, gave a presentation to orient us at the local level, emphasizing the role of the Arts Council as a “connector, presenter, and funder.” Cambridge is unique in that we were the first City to directly fund our Arts Council, but Jason and Task Force members all emphasized that it’s time to think bigger and more innovatively about the way we invest in the arts in our City. The Envision Cambridge master plan is a great place to start with this, and the draft recommendations already have multiple areas that relate to the arts, whether it’s culturally diverse programming or streamlining licensing and permitting processes, especially for performances or displays in public places. Our Arts Council is also the curator and maintainer of about 300 pieces of public art, and this will be a further topic of discussion as we delve into who is represented, funded, and prioritized in our public art projects. Lastly, there was a robust discussion on how city planning can be more intentional in promoting the arts without gentrifying neighborhoods and displacing the creative community. Developers can be resources, not adversaries, to our arts community, but only if artists are able to get in on the “ground floor” of the process – this is something both the City and Arts Council need to actively facilitate. Our municipal percent for art program is an innovative start, but we are in need of a more sustained funding source to keep our arts community thriving and local. The next meeting of the Arts Task Force will be on November 8th at 5:30PM. City Hall is not an equitable place that encourages creativity, and I am also striving to bring these meetings to the arts community instead of requiring them come to us. Therefore, our meetings will be held at creative spaces around the City – the November 8th meeting will be held as Spaceus at 20 Brattle St. It is a vacant property repurposed as a studio space, the result of work done by one of our Task Force members, Ellen, who is a co-founder of this innovative company. Because race, equity, and diversity are so foundational to constructive conversations and representation in the arts, our next meeting will be facilitated by an expert in this field, Malia Lazu. The meeting is open to the public for observation, so be sure to join us at Spaceus at 20 Brattle St., November 8th at 5:30PM.